A police officer cannot arrest people at random. 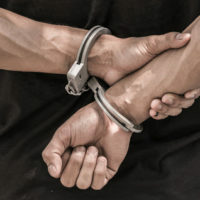 In order to arrest an individual suspected of committing a criminal offense, an officer must have probable cause to believe that the individual committed the crime or a valid arrest warrant. Obtaining an arrest warrant requires legwork on the part of the arresting officer. Below are the steps an officer must complete in order to receive a valid arrest warrant. When an arrest warrant is issued, it becomes public information and can be viewed online. To obtain an arrest warrant, an officer must submit a written affidavit to a judge. The affidavit must contain accurate information about a crime and the individual suspected of committing it. It is submitted to the judge under oath. The information contained in the affidavit must establish probable cause to arrest the individual named in the document. For example, if surveillance footage of a bank robbery clearly showed the identity of the individual committing the robbery, a warrant may be created for that individual’s arrest. But if the footage merely shows that a blond man was the robber, an officer cannot obtain a warrant to arrest all blond men that otherwise match the witness’ description of the offender. When an arrest warrant contains incorrect information, the officer may not proceed with the arrest. Examples can include an incorrect description of the offense or the individual observed committing it. In most cases, officers show the warrant to the suspect before they complete the arrest. However, this is not a requirement and sometimes, officers do not show a suspect his or her arrest warrant out of fear for their own safety or the potential to compromise evidence. An officer may not proceed with an arrest unless the warrant is approved and authorized by a judge. When an arrest warrant’s description is too broad to be accurately applied to an individual, it will likely be rejected. Arrest warrants can contain stipulations for the arrest, such as the time frame during the day that the officer may arrest the suspect. An arrest warrant may also state the amount of money the suspect must pay in bail in order to be released after his or her arrest. In some cases, the individual may not be released on bail at all, in which case the language of his or her arrest warrant reflects this. If you have been charged with any type of criminal offense, you need to start working on your case’s defense with an experienced Miami criminal defense lawyer as soon as possible. To learn more about effectively defending against a criminal charge, contact our team at Ratzan & Faccidomo, LLC today to set up your initial legal consultation in our office. We can answer your questions and help you determine the best way to proceed with your case.